Humanity is steadily getting older, which, in turn, increases the number of elderly people online. Today, almost almost 18% of Facebook users are 55 or older. 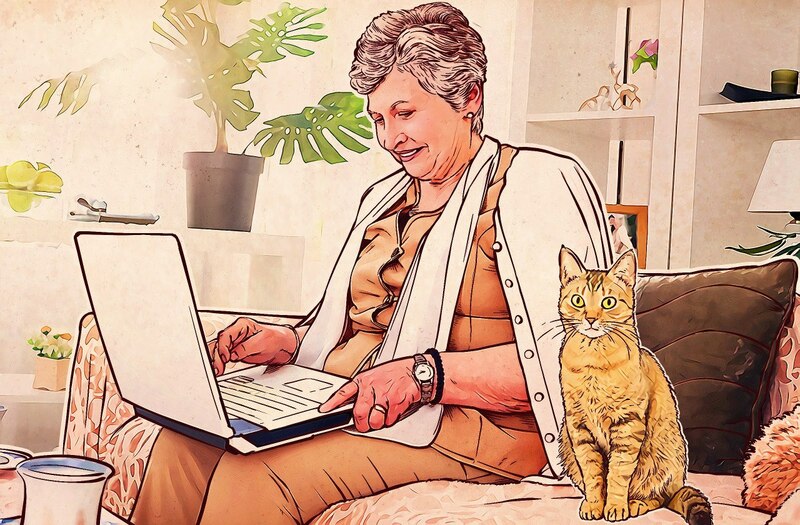 We set out to learn what elderly people get up to when surfing the Internet, whether they are aware of cyber-threats, and what they are afraid of and cautious about when online. In our analysis, we used research conducted in August 2016 among 12,546 users from 21 countries, aged 16 and above. Of the respondents, 13% were older than 55: 7% were 55 to 64, and 6% were 65 and older. What do elderly people do online? Well, older Internet users do pretty much the same stuff younger ones do. They write letters, for example: 94% of respondents aged 55 and above regularly use e-mail. Twenty-five percent of them use messaging apps and make video calls (including on Skype and Google Hangouts). Sixty-one percent of people aged 55 and above are present in social networks, where they chat with friends and communicate with children and grandchildren. Elderly people also tend to shop online and use online finance tools. Sixty-four percent regularly visit online stores and pay with their bank card. Sixty-eight percent use online banking tools (relatively high; for all age groups combined this percentage is much lower, at 59%). More than one-third of surveyed elderly users regularly book travel — tickets and hotels — online. At the same time the elderly frequently fall victim to cyber-criminals and lose data or money, or both. What do they know about cyber-security? Unfortunately, people over 55 are overall not well educated when it comes to cyber-security. Only one-third of respondents have ever heard that someone can spy on them via a webcam. At the same time, elderly people are heavy users of gadgets: One-quarter of respondents use tablets and one-third smartphones, with Apple devices being a big hit among them. These elderly people do know that their PCs need to be protected, and 93% claimed they use antivirus products for Windows. At the same time they overwhelmingly neglect to protect other connected devices. And more than half of our elderly respondents are (mistakenly) sure Apple computers don’t require protection. Things are no better with smartphones. Only 52% of people older than 55 said they use antivirus solutions to protect their mobile devices. Unfortunately, the bigger picture isn’t much better: Of all of the survey respondents, only 57% of users said they protect their mobile devices. And although 75% of elderly people protect their primary device for browsing the Internet with passwords, they fail to set passwords for their other connected devices. Only three in ten users aged 55 and up choose rigorous privacy settings in social networks and browsers. Even fewer (18%) disable geo-location in apps. We find it curious that a quarter of older Internet users tend to avoid popular websites such as Google and Facebook, citing a fear of sharing their private data. In that respect, they are twice as cautious as people 16 to 24 years old (of those, 12% share that fear). Only half of the older people we surveyed assess the potential risks of making online transactions. The majority of elderly users have heard of breaches, malware threatening their data and passwords, or online scams leading to potential loss of money. However, only 14% believe something like that could happen to them — they are much more careless in that respect than their younger counterparts. An increasing number of elderly people feel they are not very tech-savvy and are ready to ask their relatives for help. Younger family members also acknowledge that their older relatives face serious risks. More than half of younger users are concerned about their parents’ online lives, and nearly two-thirds are concerned about their grandparents. The representatives of the older generation are less aware of cyber-threats, and they are in general more trusting and thus more vulnerable. In many cases, they cannot make the most of their devices, install the software they need, or apply appropriate security settings. So make sure you regularly explain the essentials of safe Internet surfing to your parents and grandparents. And, of course, take care of their devices and protect them with a robust antivirus solution.